This article is an open letter by Emily Collingridge (right), who is best known as the author of Severe ME/CFS: A Guide to Living, a guide for patients and those involved in caring for them to the various aspects of life with severe ME. 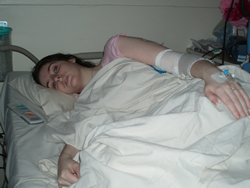 Emily has had ME for 24 years, since she was just six years old, and in the last few years has been bedridden and suffered numerous major health crises; she is probably one of the worst-affected people right now. She has earlier told her story in more detail on the Stonebird website here. Some background information is in order: Emily’s current relapse (which began in late 2009 or early 2010, around the time her book was published) was precipitated by an admission to hospital, and hospitals are notoriously un-restful places, even at night and even for people who are not highly sensitive to light and sound and other forms of stimulation as people with severe ME often are. There is a dire need for special units in hospitals to accommodate such people, or at least for them to have side rooms where they can rest without disturbance from other patients and those tending to or visiting them. There are many ME sufferers who have had their conditions worsened considerably by having to go into these hideously unsuitable hospital environments. My name is Emily. I developed the neurological condition Myalgic Encephalomyelitis (ME) when I was 6 years old. In April 2011 I turned 30. I still have ME. ME coloured every aspect of my childhood; it painfully restricted my teens and it completely destroyed my twenties. Now, as I move into the next decade of my life, I am more crippled than ever by this horrific disease. My doctors tell me that I have been pushed to the greatest extremes of suffering that illness can ever push a person. I have come very close to dying on more than one occasion. If you met me you may well think I was about to die now - it’s like that every single day. After all these years I still struggle to understand how it’s possible to feel so ill so relentlessly. My reaction to small exertions and sensory stimulation is extreme. Voices wafting up from downstairs, a brief doctor’s visit, a little light, all can leave me with surging pain, on the verge of vomiting, struggling with each breath and feeling I’ll go mad with the suffering. Of course it can also be as bad as this for no particular reason - and often is. I cannot be washed, cannot raise my head, cannot have company, cannot be lifted from bed, cannot look out of the window, cannot be touched, cannot watch television or listen to music - the list is long. ME has made my body an agonising prison. My days and nights are filled with restless sleep interspersed with injections, needle changes (for a syringe driver), nappy changes (as well as experiencing transient paralysis and at times being blind and mute, I am doubly incontinent) and medicines/fluid being pumped into my stomach through a tube. My life could be better if I had a Hickman line (line which goes into a major vein and sits in the heart) for IV drugs and fluids, but such a thing would likely kill me. I’m on a huge cocktail of strong medications which help, yet still most days the suffering is incomprehensible. During the worst hours I may go without the extra morphine I need as I feel so ill that the thought of my mother coming near to administer it is intolerable - this despite pain levels so high that I hallucinate. I live in constant fear of a crisis driving me into hospital; our hospitals have shown such lack of consideration for the special needs of patients like me that time spent in hospital is torture (eased only by the incredible kindness shown by some nurses and doctors) and invariably causes further deterioration. Many days I feel utter despair. But, unlike some sufferers, over the long years in which I’ve had severe ME (the illness began mildly and has taken a progressive course) I have at least had periods of respite from the absolute worst of it. During those periods I was still very ill, but it was possible to enjoy something of life. So in these dark days I know there is a real chance of better times ahead and that keeps me going. My entire future, and the greatly improved health I so long for, however, currently hinges on luck alone. This is wrong. As I lie here, wishing and hoping and simply trying to survive, I (and the thousands like me - severe ME is not rare) should at least have the comfort of knowing that there are many, many well-funded scientists and doctors who are pulling out all the stops in the quest to find a treatment which may restore my health and that the NHS is doing all possible to care for me as I need to be cared for - but I don’t. This wretched, ugly disease is made all the more so through the scandalous lack of research into its most severe form and the lack of necessary, appropriate support for those suffering from it. This is something that must change. You can support Emily and everyone with severe ME by joining the “Severe ME/CFS: A Guide to Living” Facebook group http://www.facebook.com/group.php?gid=114380158590669. Both sufferers and non sufferers welcome! See also www.severeME.info.